Usually a set of four identical bowls, manufactured according to official guidelines. They come in different sizes and weights and it is essential that all bowlers eventually bowl with the right size and weight bowl for them, something which can be decided through trying out different bowls. All bowls are manufactured with an inbuilt bias; the bias causes the bowl to travel in a curve as opposed to a straight line. For the right handed bowler the bowl is delivered so that it curves from right to left towards the objective. For the right handed bowler the bowl is delivered so that it curves from left to right towards the objective. The position adopted by the bowler on the mat prior to delivery. The act of delivering the bowl. The moment the bowl leaves the hand. The natural, and essential, forward movement of the arm and body following the delivery of the bowl. The curved line the bowls takes as it travels towards its objective. The point of the green (line) where the bowl begins to curve towards the objective. One foot must be on or over the mat at the moment of delivery; if not the player could be penalised. Where a bowler places the mat (within the limits of the laws) for the purpose of lengthening or shortening the length of the jack. The round white (or yellow) ball towards which play is directed. The size of the jack must conform to the laws of bowls. Near to the greatest distance allowed from the front edge of the mat to the jack. Near to the shortest distance allowed from the front edge of the mat to the jack. The playing surface, the measurements of which are laid down by the laws. Here, the surface offers greater resistance to the progress of the bowl, (it might be damp or longer grass) but the bowl will usually take a shorter time to reach its objective, because the green line is much narrower. The bowler takes the correct line to the object, wide enough to the shoulder for the bowl to finish where desired. The green is surrounded by a ditch or gutter which marks the boundary of the playing surface. Measurements of the ditch need to conform to the laws of the game. The outer wall of the ditch which surrounds the green; the bank is higher than the playing surface. Rectangular area of the green not more than 5.8 m or less than 4.3 m wide on which play takes place. An imaginary line that runs lengthwise down the centre of the rink. The amount of force with which the bowl is delivered to execute a particular shot. The basic delivery in bowls. A bowl attempting to ‘draw’ with the correct pace or weight, and with correct green, to the jack. 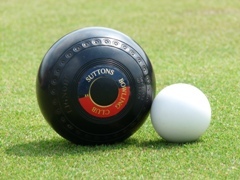 A bowl delivered at the correct pace or weight, and with correct green, that achieves its objective. The bowling of a bowl which brings it to rest against another bowl previously bowled. The bowling of a bowl with enough pace to push a bowl sufficiently from its former position. The bowling of a bowl of sufficient pace or weight that it pushes a bowl from its position so that that position is taken by the bowl just delivered. A bowl that strikes and pushes the jack ahead of it to another position on the rink. A bowl which during its running course comes into light contact with an other so that the line of direction is affected. A bowl travelling at a certain pace which comes into an angled contact with another bowl so that the course of the moving bowl is definitely altered. An attempted shot frustrated by contact with another bowl lying between the mat and the jack. An bowl delivered with enough pace to stop short of the objective, in the hope that it will prevent an opponent being able to play a certain shot. A request to the bowler to bowl a bowl with enough pace to force apart other bowls that has enough momentum to carry beyond that point. Definitely not a ‘draw’ shot but a shot where the bowl is delivered at a very fast pace. A bowl which during its course has touched the jack. A bowl which has come to rest and falls over to touch the jack before the next bowl is delivered. A bowl which, if it is the last to be delivered, falls and touches the jack within a period of half a minute. All the above shall be marked with a chalk mark. A toucher as above which has fallen into the ditch shall be a ‘live’ bowl, but not if it has come to rest outside the confines of the rink.